From July 1st 2016, Yannis is the General Manager Greece & Cyprus for the Coca Cola Hellenic, the leading company in the non-alcoholic beverages in Greece. Yannis started his career at Johnson and Johnson in 1996 in the marketing. He joined L’Oreal in 2000 where he stayed for 13 years, starting as Marketing Director Greece and progressing through various positions, including Commercial Director of L’Oreal International (Europe Zone) and later Consumer Division General Manager for Hungary. In 2007 gets appointed to Country GM for Consumer Division Greece and Cyprus. From 2010, Yannis was leading Country GM Consumer Business Unit L’Oreal in Russia. 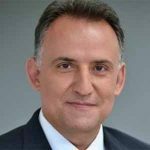 Yannis joined Coca-Cola Hellenic Russia in January 2014 as Commercial Director leading the Russian Commercial Organization of around 5000 people in 6 regions. Yannis holds a bachelor degree in chemical engineering from the National Polytechnic University of Athens and an MBA from the High School of Economics of Geneva with specialization in strategic planning. He is married and has two children. In his free time, he is engaged in sports (Basketball, Tennis, Skiing) and is fond of fine arts (such as painting and sculpture).